Mumbai based non-profit, New Resolution India (NRI) was set up in 2009 with an objective to support mainly drop-outs from school and colleges between the ages of 18 to 25 years. These students belong to the ‘Below Poverty Line’ group. NRI, is perhaps the only active organisation in Kurla working with the drop-out segment. The organisation mentors each child, provides a positive educational environment and helps groom their personalities - making them ready for employment. Three months crash courses are offered at their Kurla centre. The course covers topics like life management skills, developing professional attitude, basic computer knowledge and skills required across job profiles offered by the hospitality and retail industries. The founder, Mr. Kishore Palve has been drop-out himself and was fortunate enough to receive guidance from his parents, relatives and friends at different phases of his life. Feeling the need of role models for the several drop-outs in his community, he started NRI to fill this vacuum. Based on average trends in the past three years, 60% of total students annually are placed with various organisations, 20% opt to pursue further studies, 10% start their own shops and the balance are yet to get placed. NRI ensures that students are on the employer’s payroll, and not on temporary contracts with third party (recruitment companies). Salary earned by students placed ranges between Rs7,000 to Rs15,000 per month. It placed students with reputed companies like Vodafone, ICICI Bank, Godrej group of companies, IDEA, PUMA and Reliance Fresh. Through its mentorship programme, NRI provides each child with a life-long buddy (mentor) who could be approached for diverse issues faced by the mentee at any phase of his life. 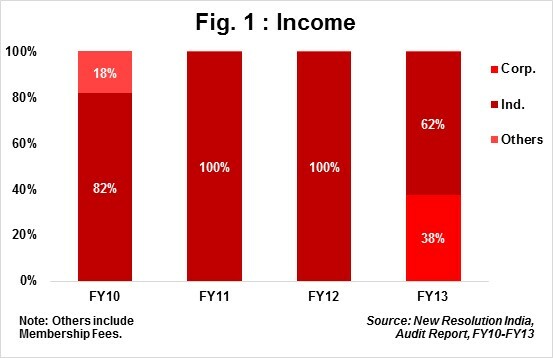 NRI posted a total income of Rs0.9mn in FY13 v/s Rs0.6mn in FY12. Y-o-Y increase of 42% in total income was owing to funds received from Tech Mahindra to deliver computer literacy course to NRI’s students. 85% of total expenses in FY13 was spent towards direct programme related activities. Considering the nature of activities (non formal education at community centre, private and public schools) carried out by NRI, 59% spent on high salary cost is justified. In the past four years more than 81% of total expenses was spent on direct programme activities. 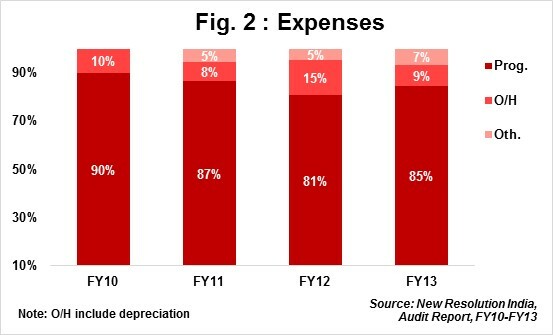 Overheads accounted for only 9% of total expenses in FY13 as against 13% in FY12. 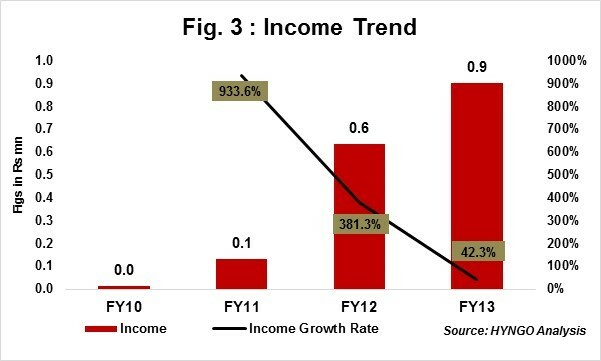 The drop suggests efficient use of funds raised during FY13. NRI posted a 4-Year income CAGR of 314% during FY10-FY13. NRI is an early stage organisation and therefore such an enormous increase from a low base of Rs12,679 in FY10 is not unusual. The CAGR will gradually stabilize in subsequent years. Self Sufficiency Ratio (SSR) declined from 121% in FY12 to 68% in FY13; suggesting drop in funds raised from own sources (individual donations, service charges, interest fee). Unlike in the previous years, NRI received over 90% of total income from individual donors. With the need to offer more courses and increase their reach, NRI approached external sources (institutions) to fund their plans, resulting in proportionate drop in own income. Despite the drop in SSR, one must appreciate NRI’s efforts to reach corporate seeking larger funds; indicating NRI’s robust plans to make an impact in the community. Founder, Mr. Palve is young (31 years old) is an enthusiastic social worker. In a short span of three years since inception, Mr. Palve has demonstrated his determination to serve the community; suggesting NRI’s strong growth prospects in future. This is evident from his collaborations and list of reputable and large institutional donors coming forward to support his initiative. Funding partners include UBS, Tech Mahindra and EdelGive Foundation. Finding experienced and dedicated mentors from walks of life. Board includes seven trustees. All trustees meet atleast once in a year. No quarterly meetings are formally held. Has an inbuilt Management Information System capturing details of each beneficiary as well as mentors. There is a robust mechanism to bring mentors on board. Monthly performance report is sent to Tech Mahindra and other financial supporters in the format designed by respective institutional donors. Conduct frequent field visits to corporate houses, manufacturing plants, banks, malls, hotels etc. This would give students better exposure to the working culture in professionally run set ups rather than just classroom learning. Monitor trustee’s participation throughout the year. Consider inducting active trustees who have the capacity and passion to fuel NRI’s growth.